Why didn’t Twigpaw join SkyClan? I think she should. Her kin is there, and she always wanted to be with her kin. Twigpaw left ThunderClan to go on a quest to go find SkyClan. Twigpaw was barley even guilty about that! She loved her kin and in the third book in a vision of shadows, she was really bonding with Hawkwing. Then all of a sudden, Violetshine is the one who bonds? I mean, that’s good and all but shouldn’t Twigpaw have a bonded too? If Finpaw loved Twigpaw enough to go to ‘ThunderClan, SkyClan or even ShadowClan,.’ (Quote from book) with her, shouldn’t Twigpaw love him enough to stay in SkyClan? Since she was about to become a SkyClan warrior (Why didn’t she? I want to know her warrior name) she wouldn’t need to be bossed around by Sandynose. And she loved kin so much she was a little obsessed. I know Violetshine was busy bonding with Hawkwing but there was Bloomheart and in the end of the book (When she left SkyClan) there was Cherrytail and Cloudmist. In the second and third book, Twigpaw didn’t seem like she was to happy in ThunderClan. So why go back? And, I also feel bad for Violetshine and Hawkwing. There sister/daughter left them!! As I mentioned, Twigpaw loves kin. So why didn’t she stay with kin?? So, I think she should join SkyClan. It seems so out of character for her to go back, and I thought if one of the sisters decided not to join SkyClan, it would be Violetshine. I think in later books, Twigpaw should go back. Like Finpaw doesn’t like ThunderClan so he goes back and Twigpaw follows. Or Hawkwing becomes leader (because Leafstar in very old and and probably out lived Firestar) If Hawkwing becomes leader, maybe Twigpaw feels a pull to SkyClan and realizes she can’t let Finpaw stay, because he belongs in SkyClan too. Or maybe Bramblestar rejects them or in a later book or maybe Twigpaw just wants to join SkyClan. I also feel that Finpaw was to quick to got with Twigpaw. I mean, couldn’t he convince Twigpaw to stay? I loved the book Darkest Night but I feel when Twigpaw left it was so out of character. I wish she stayed and maybe in a later book she could go back. Please! Please! Please! I think her and Viotletshine belong there, in SkyClan. And the two sisters would finally be together! Could Violet Paw plz come live in Thunder Clan? That’s just an Idea. Also, I have a great name for Violet Paw’s warrior name! Violet Moon! 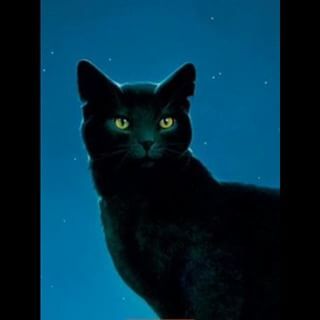 Who Crowfeather choose in StarClan between Leafpool and Nightcloud ? I’m currently reading Darkest Night and River of Fire. Both books mention a six toed cat who will play an important role in the upcoming events. However, the cats discussing this six toed cat say that all cats have five toes on each foot. This is incorrect. As anyone who’s ever looked at a cat’s feet will know, only the front feet have 5 toes. Cats have only four toes on their back feet, unless they’re polydactyl.